CENTURY STONE’S grout cleaning and stain removal services will remove surface dirt and eliminate grout discoloration. Selecting the right tile & grout cleaner or grout restoration service is dependent on your stone, tile and grout situation. As the leader in stone, tile & grout cleaning and restoration, CENTURY STONE is the most experienced and qualified company to assist you in not only selecting the appropriate care service, but delivering it. 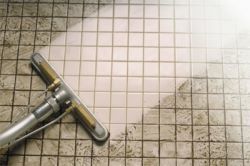 The result is the most cost effective route to restoring that beautiful, clean, fresh tile and grout appearance you are seeking. Grout Appearance Restoration (Sanded Grout) – Your Grout Can Look Brand-new Again. Grout Stripping, Repair & Re-Grouting (Non-Sanded Grout) - Restore your Non-Sanded Grout Appearance. Sheen Enhancement - Enhance the color and sheen of your slate, flagstone, Mexican tile, or quarry tiles. Deep extraction tile cleaning utilizes heated water under pressure to physically separate the dirt from the tile and grout surface. Deep extraction tile cleaning will have limited impact on stains. This is the most cost effective grout treatment. If your floor has been regularly sealed this may be all you need to restore your clean tile grout appearance. CENTURY STONE’S Deep extraction cleaning is the fastest way to a grime free floor. Enter your zip code and find the closest CENTURY STONE office and get your free estimate. CENTURY STONE is your first step towards a cleaner tile. Better than new! CENTURY STONE’S GROUTLIFE COLORSEAL process can restore sanded grout to its original color plus provide a topical seal dramatically enhancing your grout’s natural stain resistance. This process is so effective it can even be utilized to alter your grout color, if so desired. Suitable for use with sanded grout, only, makes this a common ceramic or porcelain surface treatment. This chemical treatment introduces a colored topical seal designed to bond to the silica in the sand filler. (Note – sand is not typically used with marble and granite surfaces as the loose sand can damage the stone surface). Looking for a means of getting your original grout appearance back? Whether stained, or, not, CENTURY STONE COLORSEAL provides the BEST route to a uniform, consistent grout. The treatment offers the additional benefit of offering exceptional improvements in stain resistance allowing you to maintain your beautiful floor appearance for years to come! Enter your postal code and find your local CENTURY STONE office to request your service. As always estimates are free. Give us a call. You will be glad you did! Flamed granite, slate, Mexican tile, or quarry tile looking a little dull? Would you prefer a deeper richer color, or, a higher sheen gloss? Century Stone color enhancer sealer is designed to enrich stone color and impart a new sheen to your tile. Bring your stone or tile to life with this beautiful enhancement. Century Stone color enhancer sealer is applied by professional CENTURY STONE craftsman. Surfaces are open to light traffic within 45 minutes of application. Grout Stripping or Replacing – Suitable for removing shallow stains on non-sanded grout. This approach strips the top layer of stained grout to allow the natural grout color beneath to show through. Areas of stained grout can be cut out and re-installed. However, this can result in areas of light, new, dark and old grout. In some heavily stained, un-sanded grout cases, this is the best approach. The net result is your non-sanded grout looks clean and bright once again. Call CENTURY STONE, the company with more experience, offices and solutions than anyone in the stone, tile & grout service market. Free estimates, always, and excellent results are a call away.